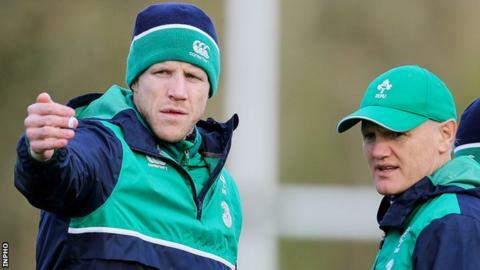 Ireland's forwards coach Simon Easterby has urged the country's Six Nations squad to ignore criticism from England boss Eddie Jones. Ahead of Saturday's game at Twickenham, new England coach Jones criticised Ireland's tactics, specifically the kicking away of possession. "Someone like Eddie is going to throw things out there," said Easterby, 40, holder of 65 Ireland caps at flanker. "We have just got to focus on what we're doing." Easterby says Ireland must laugh off the barbs from England's new boss, who has already freely admitted he will chase any available edge, including the use of mind games. "It is what it is," added Easterby. "Characters like that are good for the game, and we'll see come Saturday night how much of that rings true." On Monday, Jones said that he was preparing his England side for an aerial bombardment from the two-time defending Six Nations champions. "They kick 70% of their ball away. If they want to do that, good luck to them," said the England coach. Prior to the England coach's comments on Monday, Irish boss Joe Schmidt had reacted to a previous Jones' jibe that Ireland play safety-first rugby, insisting: "Ireland have kicked less than a quarter of the possession we have had." The Six Nations' own stats support Schmidt's view, with Ireland recorded as kicking away 23% and 24% of possession respectively in their first two matches of the 2016 tournament. The injury-ravaged Irish will chase their first win at Twickenham since 2010 after drawing their opener against Wales and losing narrowly to France on 13 February.